Fairly recently we were tipped that T-Mobile would begin excluding Ookla’s SpeedTest app from users’ monthly data allowances. The idea is that once users with data caps in place on their accounts exceeded their allowance, that the SpeedTest will still show the true network performance. On the one hand, users might be frustrated that they don’t know precisely what speed they’re limited to. On the other, speed testing apps are there primarily to show what the network performance is really like. Letting one user’s over-use affect that can taint the true network performance stats. What that means is that, from now on, any speed test you perform on your device won’t count against your data allowance. If, by some miracle, you were able to use 1GB of data in speed tests alone in a month, it simply wouldn’t show up on your account as a chargeable event. In principle, it’s the same as the way they handle music streaming in its Uncarrier 6.0 program. Wow way to go T-Mobile. Former Verizon user I currently use the LG g flex in T-Mobile and enjoy VoLTE in the Baltimore area. Next time look at my profile and you will see I have corresponded to this site several times. It occurred to me before that simply increasing the throttling limit to a less restrictive level would probably have addressed the music streaming issue without all the song-and-dance of UnCarrier 6.0…but it would have been much less easy to market. With LTE download speeds hitting 20-30mbps, even where signals are not so strong, throttling at 512kbps or even 1mbps would be a clear downgrade, while ensuring most services other than video streaming and high volume file sharing would be tolerable. So what’s the agenda? What are the services that TM are fearful will wriggle through the net, if they simply offered unlimited downloads at a faster clip? I agree. A more uncarrier move than Ucarrier 6.0 would be to provide a specific range of speeds beyond the cap as long as the radio protocol supports it. The weasel “up to” is so like other carriers. But I’d go further and say that it would be truly uncarrier if TMUS would say that 2G doesn’t count against the data quota. This way, there’d be an incentive for them to roll out LTE in the ubiquitous 2G service areas. This would be quite a pro-consumer move, putting more of their interests in the line for the roll out. Does this apply to people on old Value plans with data caps? They should add Sensorly to their list. Make it so that mapping and speed testing doesn’t use any data. Other posters do have a point though that, if all speed testing apps are whitelisted, there will be no way of users knowing their level of service when throttled. Where are you checking it? …about a megabyte. :-P Totally worth it. Maybe check to see if it shows up on your usage log in My T-Mobile as well. That may not be possible, if you use the mobile network all the time, but if you can isolate activity (by using Wi-Fi instead for a few hours), then it might be possible. Hmmm…needs to change soon. While not whitelisted, maybe their data will allow them to go through the logs and correct the inclusion. You just check your account online or via the My account app to see how much data you have left in your billing cycle before throttle. That’s not what I meant, Moby. They want to know the download speed that their normal traffic is throttled to. If the speed test sites are allowed unthrottled transfer, even if they are throttled otherwise, they can’t test to see if they are getting 50kbps or 250kbps. What is so difficult about getting this point across? your browser isn’t on a whitelist???? I mean is it that hard to bypass the freebis TMo gave out??? there’s gotta be a way, anyone chime in? Ok, now I get what you are saying. Maybe if you had said there’s a browser-based test at mobilespeedtest.com it would have been clearer. Based on comparisons between my device and online data last month, Speedtest usage was already exempted. I wonder if this works for Sensorly as well. I tried it last week but think I got dinged for data use. It was like 50mb for one test too. 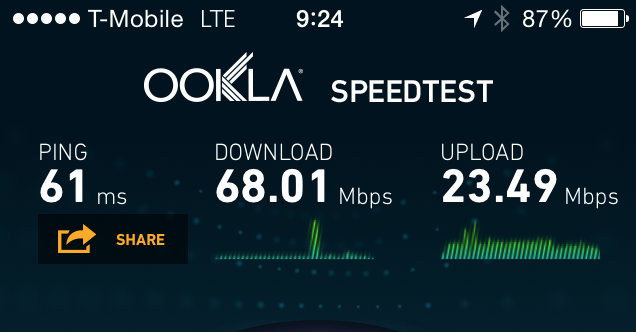 Your earlier linked blog post was about excluding speed test apps from throttling, not caps. Those are different things. whoa wow magic shamwow I think my brain just did cartwheel. The speedtest app has not counted against the cap for 3 months now at least and during that whole time it showed my real speed. It’s very simple. Or was. The point here is that if you run a speed test your data usage is not counted. It’s been like this for several months. I noticed it back in March. However, giving speed tests unthrottled speeds even when you are over your cap is not cool. Why is that not cool? Why should a speed test be throttled, especially if it doesn’t count towards data anymore anyway? Because sometimes the point of running the speed test is to get an idea of whether some data-hungry app is just misbehaving, or the network is throttled. Now the speedtest app won’t answer that question anymore. Plus it goes against the carriers reason of, “not enough capacity”, for needing to implement caps. Surely if they can start poking holes for certain services, then they have enough capacity to just up everyone’s allotment by another Gb. The people who use the most data, should be paying extra for it because they are the users who benefit the most from network improvements which cost money. T-Mobile doesn’t cap you like other carriers that charge an arm and a leg for every GB you go over, they just throttle the speed. My point is value for the money not the fact that I have to pay. I’m on a $10 2Gb plan with a 3G phone, if I ever actually got close to going over I’d switch to a larger bucket. At the same time $10, IMO, still seems overpriced throttled or not. So take your business to another company that will sell you 2GB for less than $10. Simple. It might seem overpriced to you, but you don’t know the costs of creating and maintaining cell towers, buying spectrum, building stores, paying customer service/sales/management employees, etc. And if I wasn’t signed up for a data plan, they’d still have the money from my base plan cost to maintain the towers. The towers already need internet connectivity and depending on the backhaul provider, there may not even be a meter for data use, just line maintenance. When you put the 2gb in perspective with the throughput capacity of the network it becomes an absurdly tiny drop in the bucket. It gets ridiculously smaller when you compare it to the the levels of data use some people reach with unlimited. Wouldn’t the price that you pay go hand in hand with figuring out what your getting value moneywise? How much does a comparable plan with other carriers cost? I’m sure your getting your values worth already. Verizon charges $50 for 2GB of data, you’re more than welcome to go there…and that’s on top of a $40 / mo line access for unlimited talk/text. T-Mobile has never said they don’t have enough capacity so that they need to implement caps. They have tiered data plans because some people don’t want to pay for unlimited and some people do. They could also just give away everything for free but when the time comes to pay their bills or make upgrades the money just won’t be there…. So they made music and speedtest not count against your data but you think because of that everyone is entitled to get more data? Lol, literally no carrier anywhere says this anymore. It was solely AT&T when they were signing up too many iPhone customers for the current 3G capacity. Carriers continue to charge for tiered data because the public and FCC have accepted and done nothing to stop it. You’re living in 2008 dude. If I were in charge of T-Mobile I’d be more than willing to give up that “capability” to ensure my network offers best performance on these apps, which often are used to say public opinion and acquire new customers. I’m guessing the guys in charge agree. Could you be so kind and elaborate how a speedtest app is going to show if an app is misbehaving? Wouldn’t the easiest way to see if your being throttled, is check ur data usage by using #data# or logging onto tmo my account? If you wanted to use a speedtest to troubleshoot an app, you could open your phone browser and run a mobile speedtest and the cap wouldn’t be bypassed. This. I know Android phones have data usage settings you can set to match your monthly cap and bill cycle. Plus T-Mobile has an app that will start alerting you as you near your month usage limit. I’m assuming WP’s DataSense does something similar. So Aaron’s comments is pointless. To anyone wanting to show what the throttled speeds are, all you have to do is configure your device to use a VPN connection and tunnel all traffic through it. That will alter how T-mobile sees the traffic and they will treat it like any other throttled connection. You don’t have to sign up for a VPN service because some home routers are capable of hosting VPN links. Your home internet connection would need at least 1-3Mbps upload. The higher your home connection’s Upload, the faster your device will be able to download through the vpn. The point of that would be? Are you just a troll or does your wallet only contain what momma and papa bear gave you for an allowance? Couldn’t you just set ur phone to use 2g anyways instead of telling people to use a VPN? Your fine paying $6 or so a month for a vpn but yet $10 is breaking the bank??? Pretty sure he’s trolling… Using your router with a VPN would use your WiFi not tmobiles network. Not trolling at all. You can configure phones and tablets to establish VPN links. Not my problem if you can’t see the obvious part about disabling wifi if you’re at home. if tmobile can do all this can’t they ensure that when using this app they are giving you as much of the network needed to boost the score and then go back to giving you congested speeds when you try to do other things? Even if they were prioritizing the traffic – and there is no evidence to suggest they are – they can’t boost the results beyond the raw capabilities of the network itself. In other words, if you see 95mbps, it’s because every element of the network is capable of supporting that throughput rate. An app gives you a warning and you think it has anything to do with T-Mobile? He does because the articles says: “Other speed test providers are also whitelisted.” So is Network Speed Test whitelisted as well? Aware me, but do people really do speed tests enough to even have to worry about the data they use? Relax and enjoy your devices, folks. Has anyone told you how to use your device? Relax dude. It was a simple, serious question. Why would you need to run 1000 tests a month? And why would you need to “constantly” run a crowdsourcing test? I’m not even trolling right now…..I legit can’t see a scenario in which this would need to be done other than “because I want to”. And in that case, I want to stream Netflix 8 hours a day but I don’t want it to count against my data. Can TMO fix that for me? Sensory or RootMetrics mapping + simultaneous tests? There are two functions to the crowd sourced tests. The first gives you a direct personal view of your network service in place. The second provides maps of detected capabilities in the area for others to see. The apps themselves run periodically to provide the data to populate those maps. The idea being that over a reasonably short period of time a coverage map is built based on real rather than claimed capabilities, and the data continues to be kept up-to-date. If you want to contribute to that, then the repeated running of the app is required. Since TM want to promote what they feel is good news about their improving network capabilities, it follows that they would enable the process and allow Ookla, Rootmetrics and Sensorly to tell a story that had previously been largely dominated by Verizon’s out-of-date comparative coverage maps. If I am going to be in a certain area for a while I would like to know how fast I should expect my download/upload to be. True indeed, and I completely understand that scenario. In fact, I’ve done it myself. But are you really worried about how much data you’re using for those times when you run a test in a new location? Like are you constantly running tests when you’re some place new, or is it a 1 or 2 time thing just to get an idea of the speeds? I guess my point is who was asking for this feature and why does it matter? Seems like a cheap selling point because I’d wager that most data users aren’t worrying about speed test data usage. Even just one test uses a lot of data, and it is always nice to know what quality of service you are getting in a certain area. And last I checked people are free to run as many tests as they want. The speed test apps can automatically run to map the capabilities of an area. You don’t have to sit repeatedly initiating the tests. Crowd-sourced maps are a welcome addition to the information about carrier capabilities, rather than having to rely on carrier-maintained coverage maps. I wonder what else TMo is going to do now that net neutrality is dead. What’s the next company that’ll get special internet data treatment? Makes me wonder if they’re prioritizes traffic for theses unthrottled/uncapped connections (music and speed tests) over other connections. There could be downsides to all this. Net neutrality never existed for wireless providers. Cellular was specifically exempted by the FCC. Nothing has changed on that front and they could have done it before net neutrality “died”. That means it’s even more likely that T-Mobile is prioritizing certain service’s connections over others especially with the whole uncapped music and speed testing connections. I bet T-Mobile is throttling connections to certain services now. This is definitely a concern. T-Mobile could be on their way or already are giving priority to specific traffic from companies who pay them the most. Who knows, they could be slowing down traffic from companies who didn’t pay them or were paid to do so. Preferential traffic treatment is a dangerous area to go into for ISPs. I don’t like it when one app developer gets preferential network treatment over another. Slippery slope T-Mobile. Apparently T-Mobile feels that they’d skew their speed averages if users tried to run an unsuccessful or poorly rated speediest. From my experience the Ookla app chokes over EDGE much less the “less than,” dial up speeds users are throttled too when they exceed their data allowance. Geez, I’m looking at the speed test results and wonder what’s wrong with my phone or TMO in the suburban Phila area. I’m showing ping of 41 ms; download of 14.80 and up of 3.76. This is the best result in weeks. Have been at download of 7.76 and up of 1.46. Awesome, that was quite the data hog. Speed test is going towards my data because every time I run test I see it added on my data thought it was free data ? ! I have the same issue, but it’s hit-and-miss. Sometimes the data is not added, sometimes it is. This morning, I racked up ~150MB on the TMO website tracker by running 2 tests. I’ve been home and on wifi all morning. I only disabled wifi for a few minutes to run the tests. Until I hear that the kinks are worked out, I won’t be executing any more tests unless I’ve got data to burn at the end of the month.